Once used to clear the grit out of tobacco pipes, the fuzzy, colorful, bendy pipe cleaner has become ubiquitous in the craft world, particularly in kids’ crafting. They are especially friendly for beginning artists, because pipe cleaners are pliable (and re-pliable) and often don’t require any glue to build with. Get started with a few of the fun and accessible ideas below, then set the kids free with a bundle of rainbow pipe cleaners for an afternoon of making. There's nothing like fresh-cut flowers to brighten a room, but the longevity of faux blooms can't be beat. Take an artistic approach to synthetic flowers, and craft them out of pipe cleaners. These potted bouquets look lovely on the kitchen window sill or welcoming guests on the patio. Master the art of the pipe cleaner curlicue with this sweet craft. You’ll need six chenille pipe cleaners for petals, plus an extra for the stem. Create a few in a variety of colors for all seasons and occasions! These posbale figurines are just as fun to play with as they are to make. Just a couple of swirls of pipe cleaner and foam cutouts make the perfect fairytale dragons. Attach a few to a re-configured wire hanger to create an easy mobile for an enchanted baby's room. Combine decorative paper, folded accordion style, with a tightly wrapped pipe cleaner to make a colorful butterfly. Perfect for an inexpensive craft for a group, a flutter of these butterflies can liven up any room. Perfect for Halloween, or just craft time, these spindly, skinny spiders are made using just pipe cleaners and a few plastic beads. These make great, easy homemade centerpieces or countertop decorations during October. Fix a length of pipe cleaner around a finger, twist to secure, then hot glue a decorative gem or two on top. These kid-friendly accessories are a perfect DIY for a princess party or dress up playdate. A couple of swirls of a brightly colored pipe cleaner, and you have the perfect base for a cute little chick. Add a feathered tail and googly eye to finish the craft. These are particularly great for beginning crafters—no hot glue needed. While it’s fun and easy to simply craft with pipe cleaners, why not create a full-on game with them too? Kids can twist a few colorful fish out of the fuzzy wires, then tie a magnet to a makeshift pole to “fish” at the kitchen counter! Set kids up with a few basic supplies and let them create their own unique piece of three dimensional art. A square styrofoam base works perfectly for plastic straws, pipe cleaners, and beads. The best part is, these pieces can be continually re-worked and manipulated! This handy tutorial utilizes a few clever pipe cleaner techniques (the tight spiral and the M-fold) to make an adorable set of rabbits and a cute bunch of carrots. Add these to a potted plant for a quick refresh, or to an Easter Basket in the spring. Especially if you’re trying to keep little ones away from real sugary sweets, this quick craft could help satisfy that sweet tooth (or at least distract kids for a little while). Just twist a couple of colors of pipe cleaner around themselves, then curlicue together and glue onto a wooden craft stick or paper straw. Practice naming and matching colors with your little ones thanks to these fun chameleon crafts. Build a rainbow of posable critters and and devise matching and memory games. A fuzzy red tongue and craft foam leaf complete the figurine! Put on a mini puppet show full of color and creativity with a few pipe cleaners and pom poms. Pop on a googly eye and add a few monster claws to complete these little monsters. Kids will feel absolutely encouraged to stage their very own plays thanks to these props. Help your little ones get excited for school by elevating everyday supplies with some DIY touches. 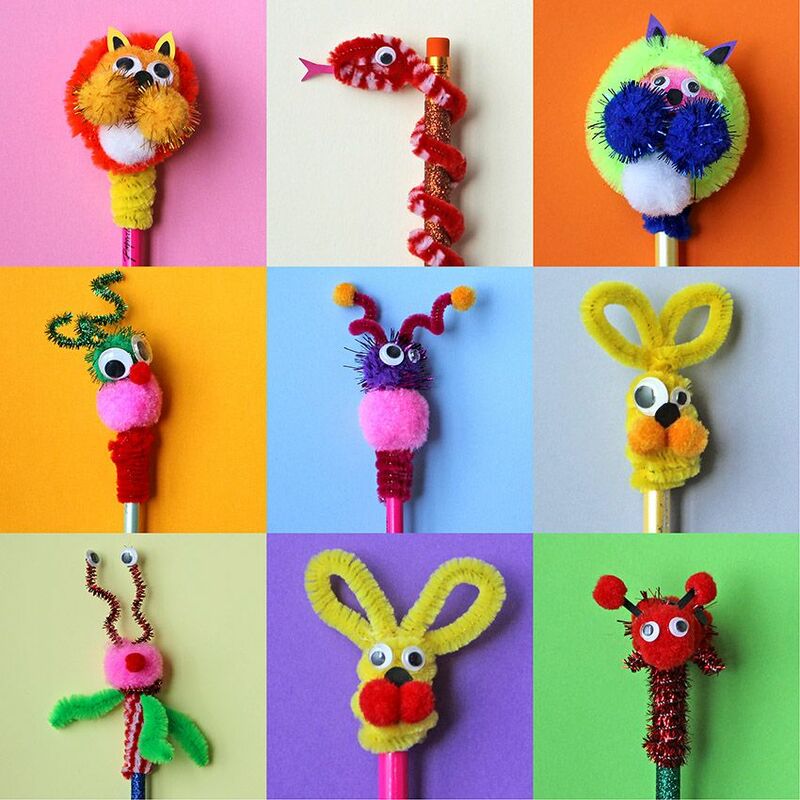 Pipe cleaner creatures can get twisted onto the top of any writing utensil. These little characters can really help ease the strain of homework time. Little ones can practice ordering their colors with the help of a square of floral foam and a set of colorful pipe cleaners. Glue on some cotton ball clouds to finish the craft. This makes a lovely decorative addition to a kids' bookcase or bedroom shelves, as well! Plastic beads fit perfectly and tightly on a pipe cleaner, and metallic wings take these creatures of flight to the next level. Opt for glow-in-the-dark beads to add an extra "wow" to a little lightening bug, too! Amplify dress up time with some easy homemade accessories! Kids can make their own jeweled crowns and royal scepters, using mostly just pipe cleaners. Hand-painted wooden beads make these monkeys really come to life! Get the family together and build a whole barrelful, then pop them onto pencils, pens, or markers for an updated coloring session. Upcycle old clothespins into chomping crocodiles with the help of this tutorial. Paint the clothespin in reptile green before adding paper teeth or bugging eyes. Use the finished product to hang kids’ artwork or encourage kids to help with laundry day. Create some friendly little bugs using colorful pom poms, googly eyes, and pipe cleaner antennae. Add a few hooked legs, then pop these creepy crawlies into the sandbox for an extra tactile toy.